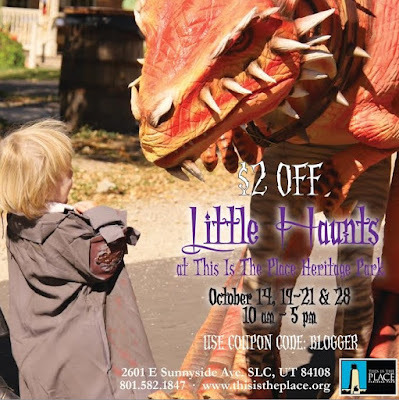 I've been hearing about 4 levels of horror at a nearby underground castle of terror in Salt Lake City. You can indicate which level of horror you want imposed upon yourself, and go from there. I'm sorry, but my days of getting adrenaline rushes from being scared at haunted houses are over! I used to tolerate it, at best. Now I can't even take it! I only wish I could use the excuse that I have to take the grandkids to 'Little Haunts', where things aren't very scary, but I'll have to wait until my sons decide to get married and have kids! Until then, I have nieces and nephews to take! 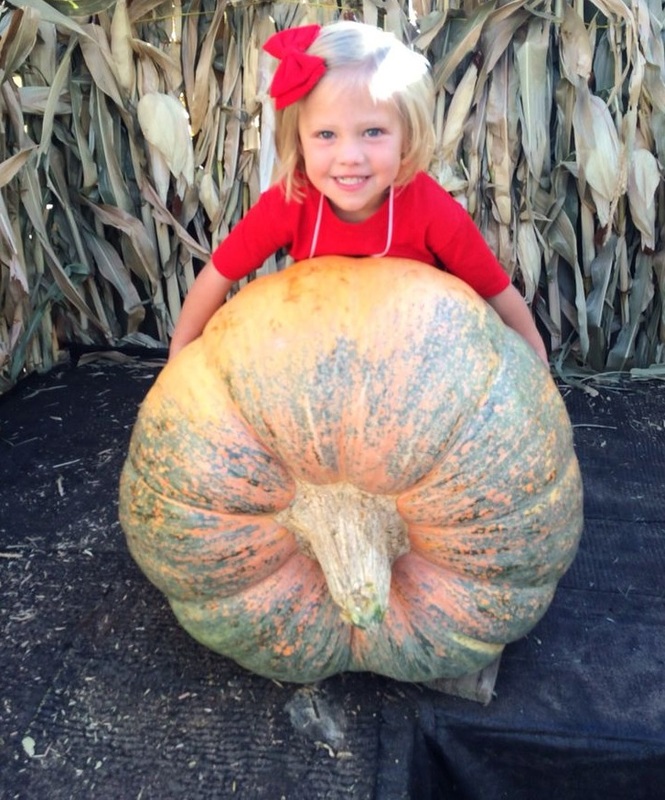 Those of you who have small children or grandchildren, you're lucky! 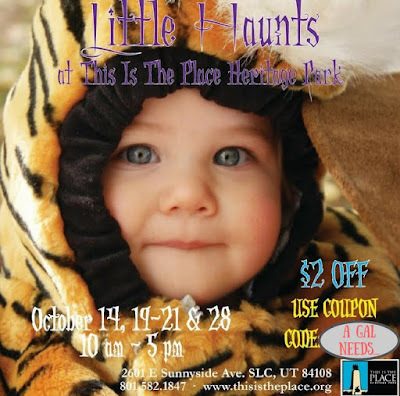 Take them to 'Little Haunts' in Salt Lake City at 'This Is The Place Heritage Park'! They will love it and so will you! Also, this year there is a special coloring contest! Download and print this page and turn it into the "Deseret Hospital" at the Park, with names and phone so the winners can be contacted. One winner from each indicated age group will be chosen and will receive 6 passes to 'Candlelight Christmas', (another amazing event at 'This Is The Place Heritage Park') and an awesome treat bag for the winner! Make sure to mention my blog, A GAL NEEDS...., to receive $2.00 off each ticket purchased! Now on to the giveaway! 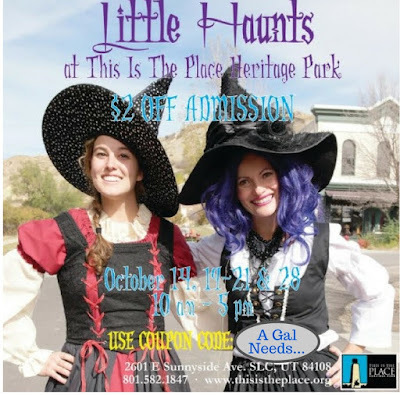 'Little Haunts' is running this weekend and on the 28th. That's it! I've got 6 passes for the 28th, and if you would like to win them, along with 2 scoops of old fashioned candy from the ZCMI store, just enter the easy Rafflecopter below with as many entries as you'd like! The drawing will take place on the 26th and the winner will be notified via e-mail, Twitter, and Facebook. Tickets will be waiting for you at the Ticket Counter at the Park! Be there, and you will be sure to make this Halloween one you and your littles will remember fondly for years to come! 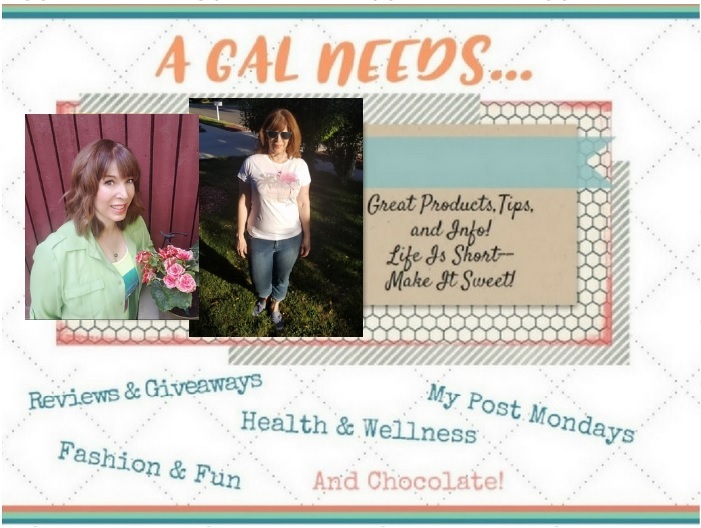 Disclaimer: A GAL NEEDS...did receive complimentary passes for the posting of this review and/or giveaway. This giveaway is in no way associated with Twitter, Facebook, or any other social media outlets. Must be 18+ years of age, one entrant per household. Winner will be selected by random draw via Rafflecopter, and notified on October 26th via e-mail and Twitter. A GAL NEEDS...is not responsible for delivery of prize. U.S. only. You are not eligible to win if you have won something within the past year from 'This Is The Place Heritage Park'.